A Toronto area man has been charged with four counts of fraud over $5,000, after taking advantage of an elderly relative. Toronto police allege that, Nick Cvetas, 49, was entrusted with an elderly relative bank account to help her pay certain bills and manage her finances. But unbeknownst to her Cvetas, between Dec. 1, 2015 and Feb. 5, 2016, allegedly withdrew large sums of money from her account on four different occasions. “Once she became aware of the unauthorized transactions, she reported the thefts to police,” police said in a news release Wednesday, Oct. 18. Nick Cvetas, 49, of Toronto, was arrested Oct. 11. Cvetas has been arraigned and is awaiting a court date. Read the full story over at InsideToronto. 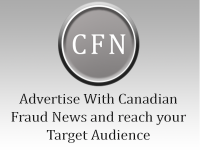 This story was summarized by Canadian Fraud News.